I thought for January it would be good to create a healthier, lighter ramen recipe to detox the body after the indulgence of Christmas. Also, as I got a spiralizer attachment for my Kitchenaid artisan mixer for Christmas, I was keen to try vegetable noodles in ramen. The spiralizer is fast becoming my favourite kitchen appliance, firstly for the hypnotising way it deals with fruit and veg, but also because it is so versatile. You can use any spiralizer as there are loads available from electric to manual ones. If you follow me on Instagram you will see my spiralizer in action! I chose courgette (zucchini), firstly because it is one of my favourite vegetables (well, it’s technically a fruit…) and it absorbs flavours really well, but also because they are low in calories and high in vitamin C. Combined with nutrient and vitamin rich miso and healthy super sprouts, this recipe is full of goodness. My husband tasked me with trying to make a five minute ramen recipe for any of you short on time to spend in the kitchen. This may take slightly longer than five minutes- but I made it after work in about half an hour maximum, including the time taken spiralizing. I topped the ramen with lots of raw veg as not only is this the healthiest way to eat them, it involves less preparation. You can top with just raw veg, but I had peppers and lettuce to use up in the fridge so below is the recipe exactly as I prepared it. First spiralize your courgettes on the smallest setting to make the thinnest noodles (alternatively you can use a potato peeler to peel ribbons of courgette if you don’t have a spiralizer- the flavour will be exactly the same just larger ‘noodles’!). Heat the oil in a wok and soften the onion and garlic. Add the chilli bean paste and stir fry until aromatic. Then pour in the dashi, bring to the boil and then lower the heat. Add the miso and stir until it has dissolved into the dashi. Finally pour in the ramen egg mixture. Keep warm while you prepare everything else. Heat a grill on high and place the salmon fillets on a tray. Drizzle with a little oil, then grill for five minutes. Brush again with teriyaki sauce and place under the grill for a further 3-5 minutes, depending on how you like your salmon cooked. 3 minutes will give you a warm but pink middle and 5 minutes will cook it through. Remove from the heat and slice thinly. Heat 1 tsp. sunflower oil in a wok and tear leaves off the lettuce, adding to the pan. Add 1 tbsp. Fun Soy chipotle and stir fry until wilted. Remove from the wok and keep warm. Using the same wok heat 1 tsp. sunflower oil. Add the peppers and fry on a high heat until the skins are blistered. Sprinkle with Fun Soy chipotle. Slice the carrot thinly. I had a small star cookie cutter from a Christmas cracker which I used to make carrot stars. Blanch the courgette noodles in boiling water for 1-2 minutes. Drain the noodles and divide between two bowls. Top with the miso dashi broth, then place the toppings around the bowl. Serve immediately. 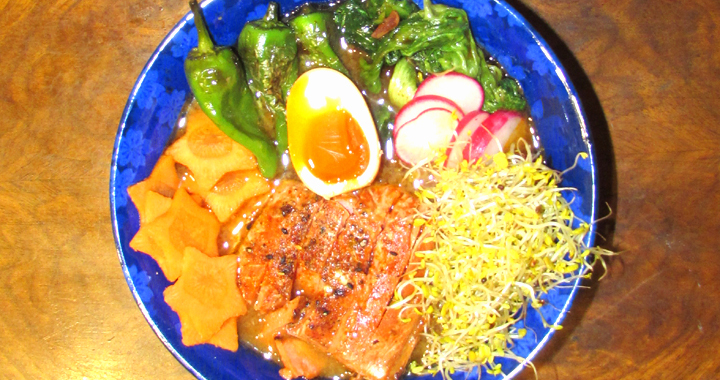 Posted in Ramen Dishes, Recipes and tagged Healthy, Miso, Ramen, Recipe, Salmon.